@headout David is here from Bonterra to answer questions and share Notes From the Vintner We are excited to have our first Casemates offering available to you. This Dry Muscat has been an on line exclusive for us and is the last of the 2017 vintage. @sdfreedive let us know that meh.com has 4-for-Tuesday: Casemates Stemless Glasses & two $8 Coupons for $16 (+ shipping) today. This wine is gorgeous as an aperitif but also terrific with Asian cuisine with a hint of spice, fresh salads, light fish or pasta with seafood. Muscat grapes were harvested in early September 2017 and slowly cold fermented in stainless steel tanks to make the most of their natural flavors. The result is a wine that is delightfully fresh, clean and dry. Being self-contained and self-sustaining can be better understood by thinking of how farms functioned centuries ago. A family farm would often exist in isolation, requiring people, animals and plants to sustain one another. These systems function together to create a single living organism: the farm as a whole. We farm our Biodynamic ranches striving to achieve this ideal with as few external inputs as possible. Biodynamic farming is a holistic view of agriculture with high awareness of the interconnectivity between earth, plants, animals, humans, the moon and planets. Biodynamics is my least favorite psuedoscience. It annoys me more than any other, probably because anything involving magic spells should not go around pretending it’s a science. That’s just cheeky. @novium I was going to +1, but then got to thinking about astrology, holistic medicine(less is more), Tarot, Reiki, numerology, I Ching, Wicca—now I can’t choose just one. @novium Biodynamic focuses on enlivening the soil by working on a closed and self sustaining system. Good farming is holistic, with everything working together in harmony. The proof of quality farming and Winemaking is in the bottle. Give it a try. @headout I don’t care about the wine, I care about the pseudoscience mumbo-jumbo. I don’t care if you dance naked under the full moon the day before harvest and sacrifice to bacchus, I only care if you tell me that it’s necessary to do so and that your wine is superior because you danced to guitars not banjos. (Banjos being disruptive to the harmony of the gravity in the grapes, natch). How a wine tastes will be a product of many things, but the music of the spheres (etc) isn’t one of them. If a wine is good, I’m not going to attribute that to the fact that someone sacrificed a white goat rather than a brown one. This is literally no different, but I’d have more respect for a good old fashioned goat sacrifice for staying in the realms of the spiritual and not bringing fake science into the mix. Though now I’m thinking what fun it would be to adapt a roman ritual to my next harvest. Maybe a simple libation, it seems less messy than anything involving entrails. Hmm. Getting on the good side of the Penates could only help. Who said I would never get any use out of my classics degrees, eh? Wow. I’d never actually heard of this before, so i had to look it up. My woo meter began immediately vibrating, even as I was typing it into the google search, and it positively erupted once the page came up. @novium I think it’s more the homeopathy of wine. I like that biodynamic farming forces more interaction with the fields. Doesn’t make it valid science, though. @novium who was it on the old boards that called biodynamics VoodooDooDoo (VDD)? Was it kyle? I’ve always liked that term. @radiolysis I compare it to scientology mostly because of how cagey its proponents get about what’s actually involved. Homeopathy tends to be fairly straightforward in admitting everything is diluted down. Wow, I have never met a Muscat I liked. That said, I’m really interested in this. Hello Casemates community! David here from Bonterra. We are excited to have our first Casemates offering available to you. This Dry Muscat has been an on line exclusive for us and is the last of the 2017 vintage. It’s a unique wine were are sure you will enjoy. Please let me know if you have any questions. @wordek In addition to the wine review above, here is another independent one to help in your decision making. Okay, the reviews convinced me. In for a case, but if there is anyone in SW MI who wants some, let me know. Hopefully we will have Lab Rats chiming in by end of day! We sent out 3 bottles. On a side note, welcome to Casemates @headout! @wordek I’ve followed up multiple times, so I wish I could know where the reviews were. It’s not looking good. Is this sweet or not sweet? I mean sweet like in sugar, not “sweet” as Ashton Kutcher said in Dude, Where’s My Car? 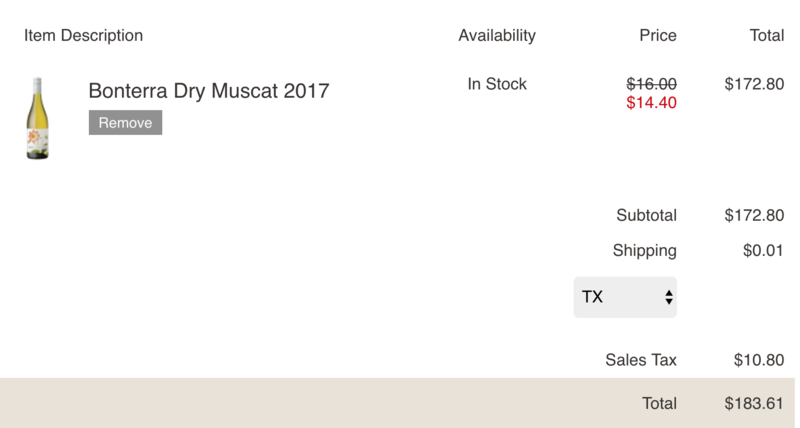 @SoSmellyAir Description says 0% RS and title says “Dry Muscat”". Seems odd but those bits plus the reviews roped me in for a case. We’ll see! @SoSmellyAir RS 0.0, or as they noted earlier, “bone dry”. Happy to see an organic wine. Fun! People should go check out https://meh.com they’ve got 2- $8 off coupons with 4 stemless glasses for $16 right now. So you’re basically getting 4 free glasses. @sdfreedive Thanks for the heads up - I jumped on that! @jhkey @sdfreedive Me too! Bought two sets. Coupons are good ‘til the end of the year. @bolligra @jhkey @sdfreedive There was an earlier reply over there (since corrected) by @Thumperchick saying that the offer was only good once. Glad to see that multiples are available. I already have 3 glasses (from the QPR offer), but I might pick up a few more and pass them along to my daughters. @bolligra @jhkey @Mark_L @sdfreedive @Thumperchick Darn, only bought one set after seeing that reply. Guess I’m buying 2 more sets. At least this is good news for my newly-formed Jewish wedding company. I might buy some of this, in case anybody’s interested. I do love those floral whites. @noodles @ddeuddeg @bahwm I was going to grab 6 if I didn’t hear from anyone else. I’ll split a case with you or split 3 ways if there’s more interest. @bahwm @catcoland @ddeuddeg I’m happy to take 4 or 6. @noodles I’ll get a case, we’ll have Hawley Zin to split as well. You can have 4 or 6 @noodles and I’ll keep the rest unless @bahwm & @ddeuddeg want some. @bahwm @catcoland @noodles We’ll take a couple. Don’t want to deprive anyone too much. @bahwm @ddeuddeg @noodles Ordered, a 3 way split works for me!